After a short coach ride across the Mississippi River, embark on a fascinating 2-hour boat trip through the swamps and bayous of New Orleans. 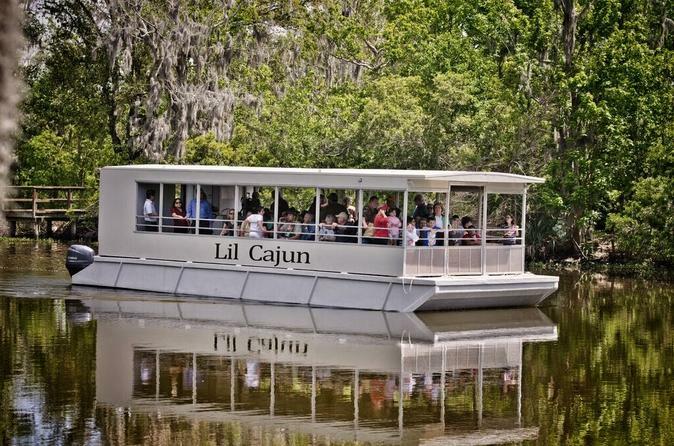 Watch the beauty of Southern Louisiana unfold as you travel through the bayous and swamps in a custom built, all-weather boat. Your guide will reveal the mysteries of this iconic Louisiana terrain as you observe the nesting grounds of native wildlife. Discover how the seafood from the bountiful waters provides a wide assortment of delectable local dishes. Observe the nesting grounds of alligators, egrets, raccoons, nutria, and many species of snakes. Some wildlife are more numerous during the warmer months of the year. Along the way, learn all about Cajun culture and ingenuity — hear how Cajun people turned soup into gumbo, a famous Louisiana dish; the washboard into a musical instrument; and, of course, the swamps into a natural paradise. Your guide will also explain how these lush, untamed swamps and bayous are slowly disappearing. Learn about the efforts made to preserve and restore Louisiana's vanishing wetlands for future generations to enjoy. You'll return from the bayous for a coach ride to the French Quarter in New Orleans.